Last Sunday’s annual gathering at Meriden took place as usual. Only this year it did not rain, despite the greyness of the day. Though in recent years the numbers in attendance seems to be dwindling, it appeared this year that the gathering was up numerically as seen through the eyes of Max Scott and myself. Other local riders to attend were George Stevens and John Dunkley, as well as Bob and Sue Hastings. Any others that I may have missed from our area, apologies for the omission. Both Max and I used the train to re-trace to Rugby, then rode the miles to the excellent Catthorpe Farm for afternoon tea. Northampton with some train assistance was an easy 50 miles. Hopefully, if you thought that attending at Meriden is beyond your mileage capability, the above may help you to re-appraise. Perhaps then the numbers who attend could continue to increase, and that the unique experience of Meriden (the centre of England) could be shared and enjoyed by so many more from our area. This leaflet from last year’s event gives a flavour of the ninety year’s history behind Meriden Rally. This ride will explore some sites linked to the great evangelist and translator William Carey (1761-1834), including Hackleton, Piddington and Olney. In Olney, as well as a tea-stop, there will be an optional visit to the museum connected with two men who influenced Carey: Cowper and Newton (£4.50 entry). This will be approximately 35 miles at a moderate pace. There are some moderate hills on the way back. If the weather remains dry we may use one short off-road section, so don’t bring your best racing bike (but if you do, there is a road alternative). Meet at the Canoe Centre, Bedford Road, at 1.00 p.m. I have just uploaded the first of a planned series of updates over the coming weeks and months. I shan’t announce when future updates occur- just this first one to draw your attention to the fact that things will be changing and I’d like to know if anything goes wrong. If you notice that anything is broken then please let me know and I will fix it. But before reporting it, do try a refresh (usually F5) and also selecting the web-address in the browser bar and re-loading the page from there as it’s possible that your view of the pages is being loaded from either your own computer or somewhere else on the internet. Also, if anything changes for the worse then I would be interested in your opinion. Five members assembled outside Moulton Co-op at 9.30 a.m. – Iain D (our leader for the day), Brian, Dave, Mike and Ian M – for a loop to the north, around Market Harborough. Elevenses were planned for the Waterloo Café at Great Oxendon and lunch for the World Peace Café at the Buddhist Centre in Kelmarsh. It was also agreed that we’d use roads, rather than the Brampton Valley Way, to get to the first café. We started promptly. The route can be found here. (Speed and ascent details are missing but Brian gives the total ascent as 2,700’.) It was a splendid route, taking us into parts of south Leicestershire we don’t often visit and such delights as a very smoothly surfaced descent from Harrington to Newbottle Bridge and a memorable lane north out of Market Harborough over the A6. We were in good spirits at the Waterloo Café and a bacon sandwich was consumed prior to the expected vegan cuisine of the Buddhists’ café. Market Harborough and Great Bowden were quiet. The lane from Great Bowden to Welham is accessible really for non-motorised travellers only and was full of cycles, horses, dogs and ponies. The descent on the B6047 south of the Langtons was enjoyable then we were up into Foxton and Lubenham and Iain D’s favourite climb through East Farndon. Quiet lanes took us to the Buddhist Centre at Kelmarsh where disaster almost struck – the café was closed because the Buddhists had all gone to a Spring Celebration. A short detour took us to Kelmarsh Hall and its tea-room. Added bonus – although it’s probably not official CTC policy to admire motor cars – was to find the Mercedes-Benz Club’s W123 Rally taking place with a host of classic Mercs parked on the drive in front of the Hall. After lunch, it was a straightforward pedal back though Haselbech, Cottesbrooke and Brixworth to cross the dam at Pitsford Water and return to Moulton. Brian was a Good Samaritan outside Brixworth, helping a lady cyclist who was trying to get to Hinckley without a map! It was a cool day. Everyone arrived at the start with plenty of layers on – and none were shed during the entire ride! We all agreed at the finish, however, that it had been an excellent day’s cycling and that big thanks were due to Iain D.
P.S. Tales of Bromptons, Manchester and Rain! The official Brompton Bicycles video of the event with good footage of the velodrome is here – it’s short (1’31”) and even if you don’t blink at 1’07” you’ll miss me. The best video of the Bromptonaut in the canal is from my friend Mick Blackman here. My own photos are here. This ride combines two of our favourite teastops with some familiar (and some less-familiar roads) to the north of the town. 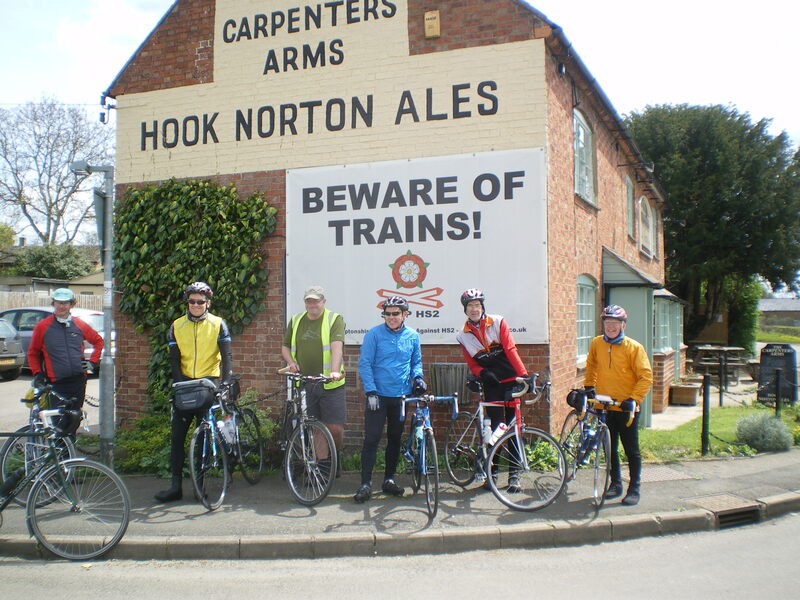 We’ll be heading out from Moulton up towards Arlingworth for a stop at Waterloo Farm before making a loop of Market Harborough to return via the Buddhist Centre’s café in Kelmarsh. Those of you requiring something more substantial at lunchtime might want to take advantage of the shops in Market Harborough to grab a sandwich, or bring your own (it is nearly summer after all! ), as the food on offer at Kelmarsh reflects the Buddhist ethos of the centre and so is a bit light on beef, chicken, pork etc. Depending on riders and weather, we may choose to avoid the Brampton Valley Way and ride up the main road in to and out of Waterloo Farm. If this raises any concerns, let me know at the start of the ride. See you at Moulton Co-op on Sunday at 9.30 a.m. Eight regulars rolled-up in Hunsbury Hill to venture out to the far south-western recesses of our county with a view to seeing the landscape before the proposed High Speed rail link gets built. We were joined just a few miles out of town by John Dunkley, who rode with us for a while and then headed off when we neared Byfield, so we were a peloton of nine heading out with a tail wind on Sunday morning and, I have to say, the far recesses of the county were looking very green after all the recent rain. We got to see several new-to-us roads and a fair bit of sunshine too, so I’d like to thank Brian for organising a ride out past the boundaries of our normal riding territory, booking the weather, and ensuring that we all made it round, despite the climbing. No rain today – what’s going on! 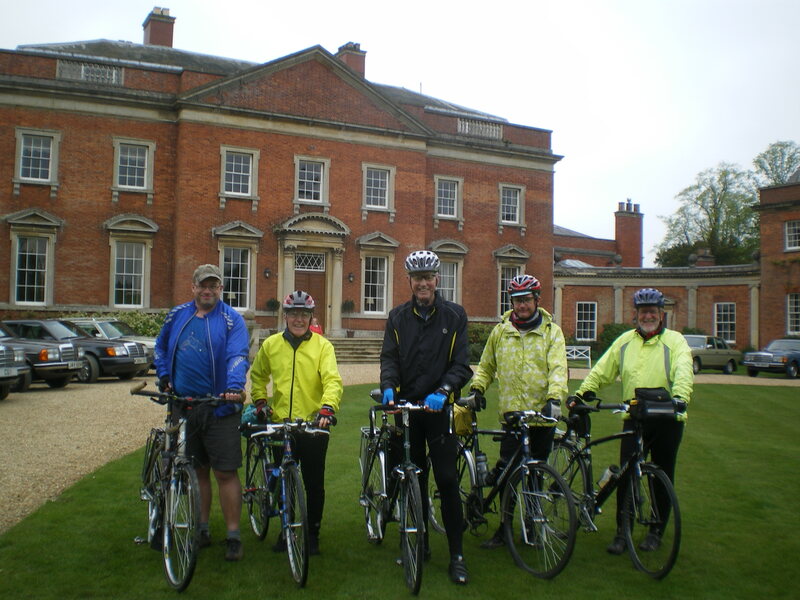 It was a pleasant, mostly sunny day for a ride which aimed to complement the Waendel Walks’ weekend centred around Wellingborough. In the end four of us completed a circuit of the Wellingborough Parishes and encountered a lot of walkers and a fair few cyclists as well. So whether another year we can link up more constructively with the Waendel programme might be worth considering. It was nice to welcome a new rider – Ray Hebworth down from Yorkshire for the weekend – and Wendy Lewis who has ridden with us before. Irchester Country Park was a welcome stop for coffee and cake and our return to Moulton just nudged the 30 mile mark.